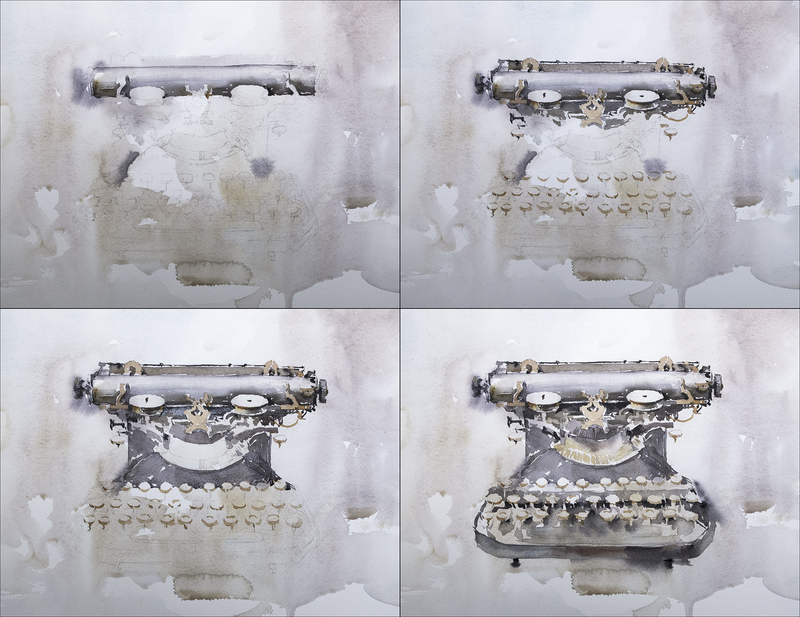 I recently undertook a set of still life paintings of manual typewriters. I’d like to think, this is the one I’d use to write a detective novel. Some people say they get stuck for ideas. Artist’s block! I’ve never had that problem – for paintings, (or for writing). I keep lists. And lists of lists. Little books full of thumbnails, folders full of sketches. Subjects that won’t go away keep re-surfacing. I find the same sketches over and over (sometimes years apart). I come up with a concept, and I see I already have it on a list, buried in an old notebook. 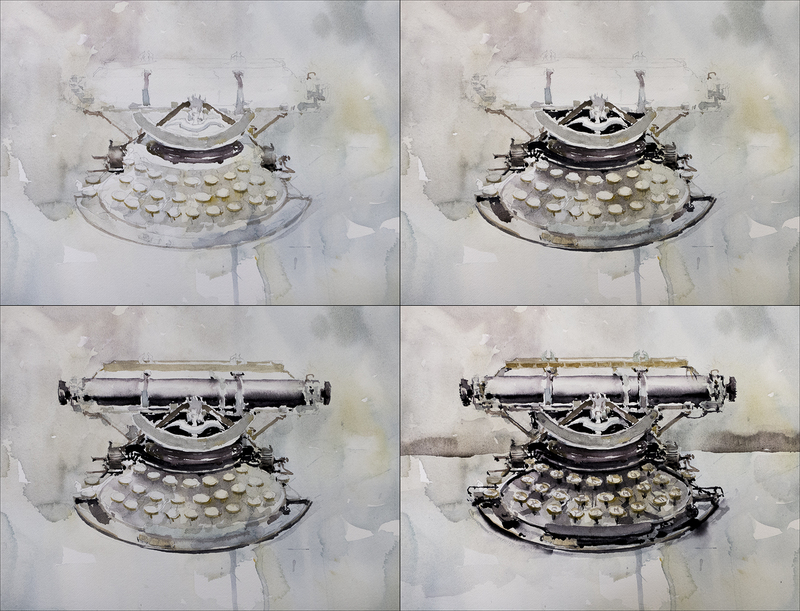 I finally got around to these typewriters – just in time for the Canadian Society of Painters in Watercolor. We’re doing an exchange with the Société Française de l’Aquarelle (SFA), and, I’m happy to say ‘The Mystery Writer‘ was selected for both shows. Halton Ontario at the Helson Gallery, June 6- July 7, and in Avignon, France at the Cloître St. Louis, Aug. 28 – Sept 17. This one is clearly for a science-fiction screenplay. It doesn’t get more retro-futuristic! Here’s a step by step of the painting process. You’ll see I did a clean line drawing. Then it was simply a matter of taking on each major component one at a time. Not quite following my normal Larger>to>Smaller and Lighter>to>Darker approach. Mor of a nit-picky, one element at a time version. It’s a bit like assembling a model airplane or doing a jigsaw puzzle. A good rainy day activity. Collectors of these antiques might know this particular machine. If you do, you’ll see I’m taking plenty of liberties. Just like that time I was sketching motorcycles. I enjoy the game – giving the impression of mechanical gew-gaws without rendering every cog and flywheel. This one is kind of a comedy of errors. I call it ‘The Cheshire Cat‘. Once you see the cartoon grin, the painting is doomed. You can’t take it seriously any longer. I debated showing this one at all, but I suppose it’s interesting that a piece can fail for reasons that have nothing to do with your drawing skills or paint handling. I also couldn’t get to comments the usual way. But, Marc, these are just terrific. The Cheshire Cat is as well. Wonder if I would have seen that if you hadn’t pointed it out first. Enjoying seeing how you develop a painting. 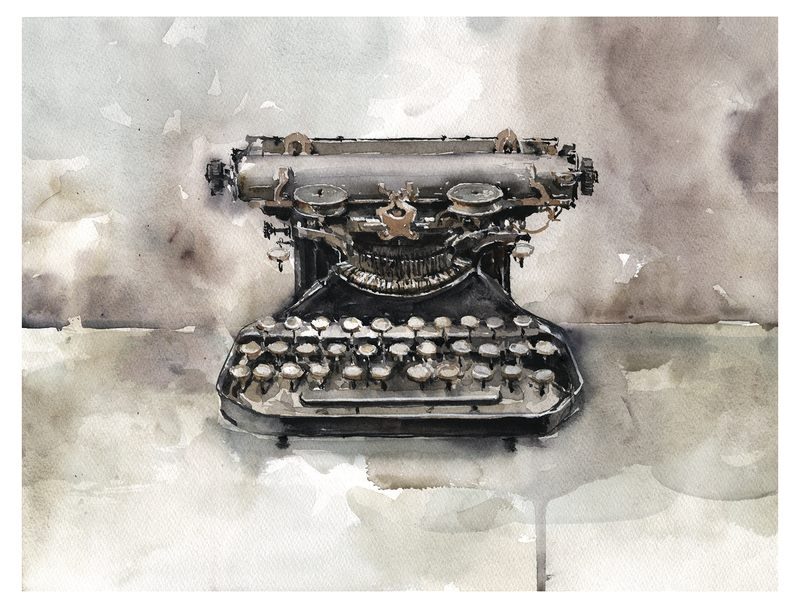 and–I love old typewriters. I learned on what would now be called “old”, but I would love to have one today instead of the one on my laptop. What fun! 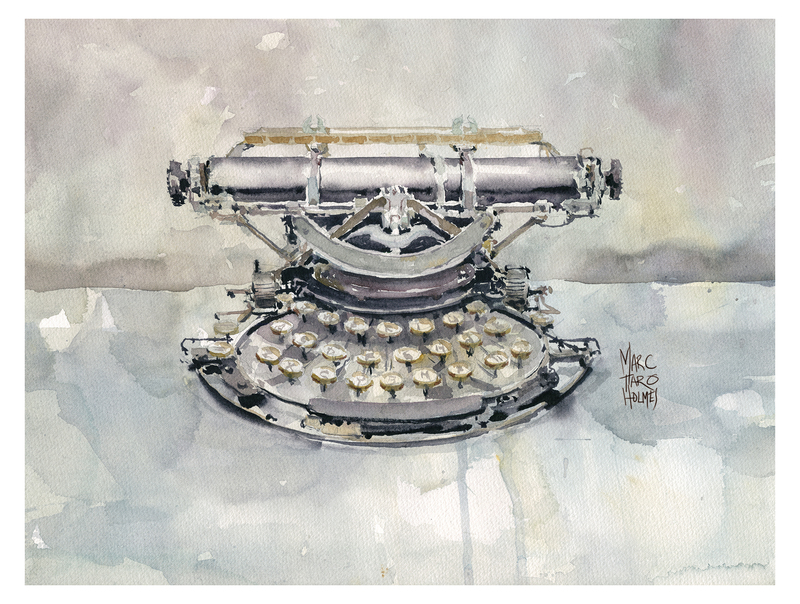 You are a wonderful watercolorist and writer, and the sense of play here is spectacular! Thanks for sharing. Fabulous… thank you for inhabiting that space of painting as writing, writing as painting. I know that space too. Did someone tell you that these paintings look like dresses, or women wearing dresses of keys? 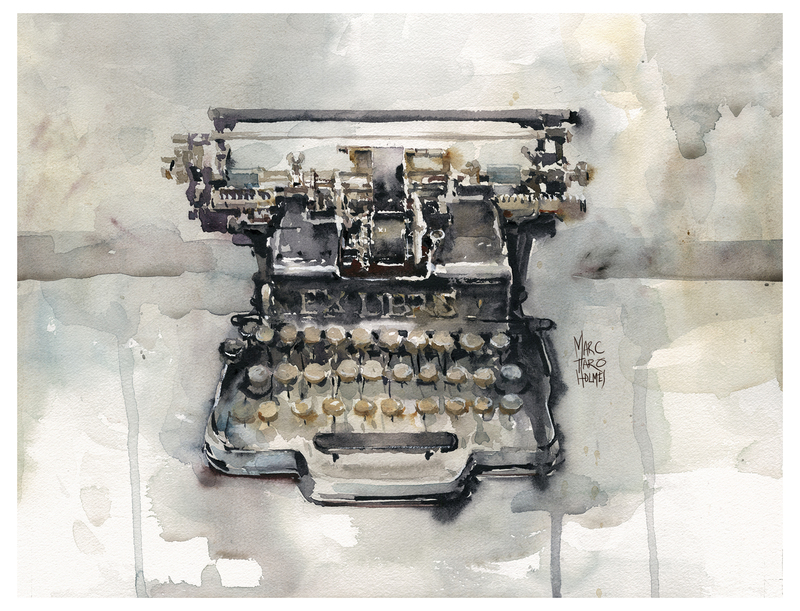 I like the dreamlike quality of the paint with the hard technical side of the the typewriter. Love the typewriters! Saw the Cheshire Cat before I even read your narrative. But I don’t understand your reluctance to paint it or your idea that is a failure. It’s a whimsical, humorous painting. I don’t paint, yet! So I see only something I wish I could do so well! I think both paintings succeed marvelously. So glad you chose to include Cheshire Cat. Fun seeing your process too, and I totally agree about the artist’s block/writer’s block thing — there’s always something to do. Ideas are everywhere. Pick something and start drawing works for me when I’m at loose ends. These are wonderful. Writers seeing these typewriters are going to feel inspired. I am sure of it. So you’ll probably cure somebody’s writer’s block! We all love the Cheshire Cat, though to me it’s not obvious in the final painting. In step no.3 it is definitely there and rather jolly! All these paintings are most appealing; the background and foreground are especially delicious. Excellent marc this is your creations ? Yes! It’s different hey? Not my usual street sketching! This is really appreciated. This is your business ?